Marshmallow Man to Ironman: Road Bike, Disc Brakes? To Disc or Not To Disc? 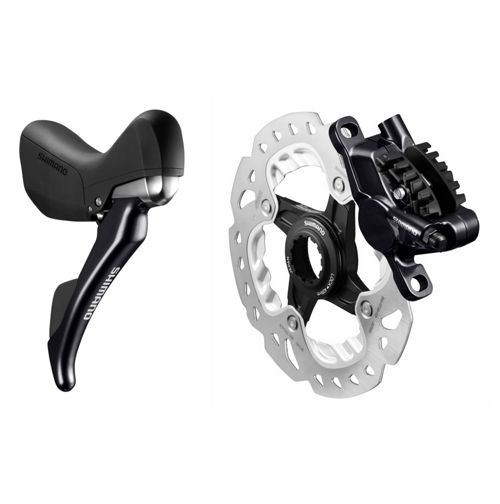 Road Bike, Disc Brakes? To Disc or Not To Disc? The UCI has approved disc brakes for the pro peloton, which has caused a bit of debate and excitement... but the real question is should you or I upgrade? As a mountain bike enthusiast I've used discs for years, and they make an enormous difference, especially when it gets mucky/wet. They don't get gunked up as easily and they retain their stopping power. Oh and what stopping power - when you hit the brake you feel an immediate response, even with very little force. It actually takes a bit of time to get used to feathering your brakes without skidding! The other difference is on the maintenance side - changing a pad is easy enough, but bleeding brakes is a bit of nastiness best left to bike shops. I've tried it myself with varying levels of success... and the odd brake fluid shower. This will mostly come down to how you ride and where, but for me I rarely brake on my road bike - we're talking once every few minutes, and usually because I'm at a stop sign. I might feather them in between to stay off someone's wheel or what not (when I'm in a group ride, which isn't that often). Contrast that with mountain biking where you speed to the corner, hammer the brake, speed to the next corner, hammer the brake... I'm on the brakes every few seconds! The other major difference is those skinny little road tires - they only have so much grip, and you will reach their limit pretty darn quick no matter what kind of brake you use. So as a value proposition it's pretty weak ... how much faster will your rides be with disc brakes? Safer? It's got to be pretty marginal, unless you live somewhere with a lot of long winding descents. So if you're still in, now comes the sticker shock... you need a new frame. Road bikes haven't traditionally come with the disc brake install holes. There's probably a better word for it, but if you want discs on the rear, you need a new frame. Oh sure, there are some conversion kits, but if you got this far you best be doing it right... I wouldn't risk my frame, that's for sure. If you like going over the handlebars and on to your face, then you could just swap out the front fork and install discs in the front only. I don't. There are also precious few frames available at the moment - I'm sure it's about to change with the disc brake tsunami that is coming, in a few years this might be as standard as it is on mountain bikes... but for now prepare for some sticker shock. I certainly wouldn't upgrade just for discs, for the kind of riding I do it's not worth it. But if I were in the market for a new ride anyway? I'd definitely be tempted... depending on how much it adds to the sticker. Or put off the purchase a year and see what's available in the fall, I get the sense this is about to be a mega trend.